2500 hours of design, prototyping and testing has culminated in a totally new riding experience. Each unique steam bent frame, wheel rim and handlebar is meticulously constructed from specially selected American Black Walnut and European Birch. This 200 hour process achieves perfect flexi-gidity. 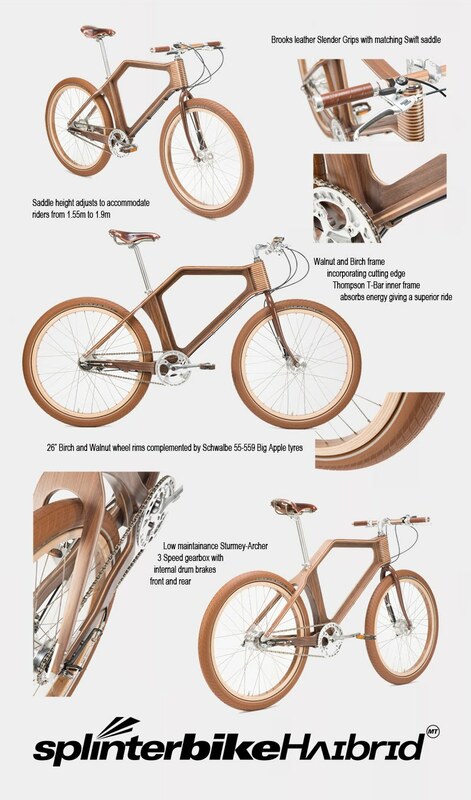 SplinterBikeHʌɪbrɪd is being produced in Norfolk England as a limited edition. Please contact Michael Thompson to discuss your reservation: email here.